Submitted by Gordy Smiff on Sun, 05/04/2008 - 18:19. Right then. Against my advice, a friend of mine is attempting to restore this...this......thing. I know it's a Hondo (I just puked in my mouth a little when I typed that) but I can't find a model number/name for it. Any ideas? Posted by 1bassleft on Tue, 05/06/2008 - 00:14. I think it might well be from around 1983-1985 and Korean but I'm not sure. We have a contributor called sb and he runs vintaxe.com which has quite a number of Hondo catalogues. People have to register to see the catalogue pages but he might just pass by soon and perhaps tell you of the model name. BTW, I read a lot about the supposed excellent quality of 80s Korean Hondos but I don't get it. I have a left P-bass copy and (apart from Grover tuners) it is absolutely ghastly. Doesn't stop people paying silly money on Fleeb for them but I don't know why. Posted by glw on Tue, 05/06/2008 - 08:46. Look at the size of that case! I've seen these on Ebay, but forget the model name. Posted by Gordy Smiff on Tue, 05/06/2008 - 21:10. I dare not show this thread to the owner, he'd cry like a baby. It really is a horrible thing, imagine falling over on stage with it, you'd be lucky not to impale yourself one one of the many pointy bits. Posted by Tim on Tue, 05/06/2008 - 21:57. 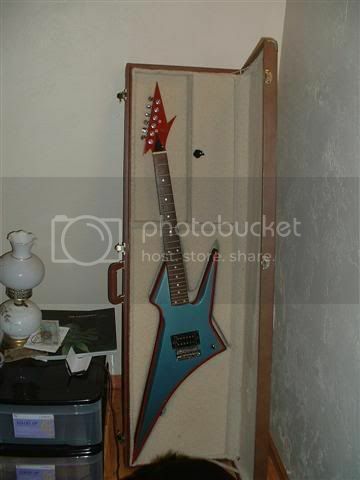 Is that a 'Hammerite blue' finish by any chance? Looks just like my toolbox. Posted by Gordy Smiff on Tue, 05/06/2008 - 22:43. Actually, I think it might be ''Smoothrite'' but it's hard to tell. Well, when I say hard to tell what I really mean is I can't look at it for more than a couple of seconds before feeling nauseous. Posted by Michael on Wed, 05/07/2008 - 01:35. The way the neck joins the body really irks me. Posted by vitaminE on Wed, 05/07/2008 - 13:38. The WHOLE THING irks me. I instantly pictured some low-budget mullet-headed d-bag in zebra spandex taking himself WAY too seriously while playing bad speed metal. Posted by Tim on Thu, 05/08/2008 - 21:52. Posted by lee_UK on Fri, 05/09/2008 - 23:15. I think it's the 5H-1T model. Posted by Tim on Sun, 05/11/2008 - 09:24. You sure its not the V3-RY/5H-1T version, or is that paint job decieving me?